Editor’s Note: This article was prepared from press materials provided as part of the newly renamed Society of Nuclear Medicine and Molecular Imaging’s (SNMMI) 59th Annual Meeting in Miami. Using one PET/CT exam and follow-up PET scans instead of multiple PET/CT scans may provide physicians with the imaging information they need while exposing the patient to less ionizing radiation. The addition of CT during multiple imaging studies for one patient can dramatically increase their radiation dose, but research presented at SNMMI’s annual meeting suggests that just one CT scan is enough to support more than one PET scan. Multiple PET scans are sometimes necessary for imaging injected biomarkers that take a long time to bind to their targets, during diagnostic studies that require pausing, or during scans to test new therapeutic drugs. During the study, researchers worked with five volunteers who were imaged in two sessions of dynamic brain PET/CT scanning with a new biomarker for amyloid plaque, which is implicated in cognitive decline and Alzheimer’s disease. After an intermission during imaging, subjects were placed in a different position, and another imaging study was performed. Both studies were 80 to 90 minutes long. Scientists compared images from the second PET study using the original CT image, the realigned CT image, and the second CT to determine whether using only the first CT scan was feasible. Researchers concluded that one CT image could be used during multiple PET studies to achieve satisfactory image quality. PET/CT using both F-18 NaF, a sodium fluoride probe with an affinity for bone, and F-18 FDG, which targets areas of increased glucose metabolism, may detect more cancerous bone lesions than other methods, according to research presented at SNMMI’s annual meeting. 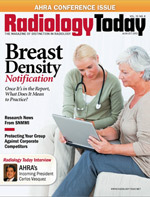 “This study demonstrates that the addition of molecular imaging with combined radiopharmaceuticals to conventional CT improves the power of imaging for cancer diagnosis,” said Andrei Iagaru, MD, a lead study investigator and assistant professor of nuclear medicine in the radiology department at Stanford University. This study was the first of its kind comparing the use of PET involving both F-18 NaF and F-18 FDG with CT alone in the detection of bone metastases. Since tumor cells have much higher metabolism than healthy cells, high uptake on FDG scans indicates increased cellular metabolism and possible cancer. Malignant bone tumors also remodel the adjacent bone at an increased speed, which NaF can detect. The combined use of these biomarkers provides a multilayered view of the biological processes involved in tumor growth in bone. During the retrospective review, 51 cancer patients with various primary malignancies underwent three different imaging studies, including NaF PET/CT, FDG PET/CT, and a combination scan of NaF and FDG PET/CT. Researchers then compared the results of all three imaging studies, as well as the CT component alone, for the detection of bone metastases. Results showed that the composite NaF and FDG PET/CT images led to the identification of more bone metastases than the other techniques. Future availability of this technique will depend on further evidence of its benefit for bone cancer imaging. A new method of 4D PET image reconstruction can compensate for blurring caused by cardiac motion, according to research from China presented at SNMMI’s annual meeting. The new method provides sharper images of cardiac function to help physicians diagnose and treat cardiovascular disease. The new method of 4D PET image reconstruction works by taking data from specific points—similar to individual frames of film or video—when patients are taking air into their lungs or when blood is being forced by a contraction of their heart muscle. Where most imaging techniques offer predominately anatomical pictures, PET allows physicians to see how the heart is functioning. The new reconstruction technique uses quantitative image data and an algorithm designed to transform the original image into a clear 4D image without the hazy areas ordinarily caused by cardiac and respiratory motion. “People have previously worked on compensating for either cardiac or respiratory motion in image reconstruction in the past, but our research is the first viable reconstruction of a PET image with compensation for both cardiac and respiratory motion using all the PET data,” said Si Chen, PhD, lead study author and a research scientist in the department of engineering physics at Tsinghua University in Beijing. The imaging contrast between myocardium and heart chambers in the reconstructed 4D images was significantly improved (15%) with the new method. Image noise was found to be 60% lower than with conventional image reconstruction with cardiac gating. “This research provides an opportunity to further improve the diagnostic accuracy of cardiac PET imaging, which can be exchanged to some degree for faster scanning and lower dose,” Chen said. A customized skin patch radiation treatment for basal cell carcinoma completely destroys facial tumors without surgery or major radiation therapy in 80% of patients studied, according to research presented at SNMMI’s annual meeting. There are two main types of skin cancer: melanoma, which forms deep in the cells that produce pigment in skin, and nonmelanoma cancer, such as basal cell carcinoma and squamous cell carcinoma. Basal cell carcinoma is the most common type of skin cancer that affects the surface layer of the skin. Researchers have developed a treatment called a phosphorus-32 (P-32) skin patch, a radiation spot treatment in the form of a patch that can safely and easily kill skin tumors with a few easy outpatient appointments. This therapy is ideal for patients with skin cancers that are very difficult to operate on, especially if skin grafting after surgery would be a challenge. In this study, 10 patients between the ages of 32 and 74 with facial basal cell carcinoma were treated with custom-made and fully sealed P-32 patches. Subjects had lesions near the eyes, nose, and forehead, and all were treated locally with the P-32 patch for three hours on an outpatient basis. The custom patches were reapplied on the fourth and seventh days after the first treatment for another three hours each, delivering a fragmented dose of 100 Gy to the cancerous lesions without harming deeper structures or other areas of healthy skin on the face. Biopsies were taken at three months and repeated within the three years that followed treatment, and eight of 10 patients were found to be entirely cured and cancer free. Further research will need to be conducted before the P-32 patch can be provided for general clinical use to treat basal cell carcinoma and similar superficial skin cancers. In the United States, it is estimated that one in five Americans will develop the disease at some point in their lives. Using PET imaging to pinpoint hormonally active tissues in the body could change the course of treatment for approximately 35% of neuroendocrine cancer patients by better identifying which patients are candidates for surgery and which are not, according to researchers at SNMMI’s annual meeting. Some patients who were previously considered inoperable went on to have surgery, and patients with previously unknown and extensive cancer who were originally slated for surgery were considered inoperable. Ruling out surgery in cases that are unlikely to be treated successfully with resection saves patients from the stress and potential complications of unnecessary surgeries. In this study, investigators used PET/CT and the radionuclide Gallium-68 (Ga-68) DOTATATE to image neuroendocrine cells—especially those within cancerous tumors because they are more active than healthy cells—that show up as hot spots on PET scans, letting clinicians know where neuroendocrine cancer is proliferating. Results of the study indicated that the combination of PET/CT and Ga-68 DOTATATE was highly sensitive and specific for assessing neuroendocrine tumors and changed the course of treatment for a large number of patients. Prior to imaging, more than one-half of the 61 patients who were picked for the study were considered eligible for surgery to remove their cancer. The remaining 29 were determined to be inoperable. Subjects were then imaged using Ga-68 DOTATATE PET/CT. After molecular imaging, about 36% of patients had a change in their management. Of those who were originally classified as operable, 14 were subsequently considered ineligible for surgery. For patients who were at first considered inoperable, eight went on to undergo surgical resection of their tumors.